1) HOW DO I KNOW IF MY CHILD IS IN NEED OF ORTHODONTIC TREATMENT? It is usually difficult for you to determine if treatment is necessary because there are many problems that can occur even though the front teeth look straight. Also, there are some problems that look intimidating and complex which will resolve on their own. Asking your general dentist is a good reference, but we are your best resource since orthodontics is a specialty and it is all that we do. 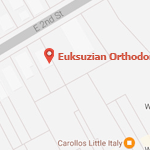 At Euksuzian Orthodontics, your child’s initial exam is complimentary and we are more than happy to see your child and make any necessary recommendations. 2) WHAT ARE THE EARLY SIGNS OF ORTHODONTIC PROBLEMS? Ask your child to open their mouth, and let you look at their teeth. If you see any signs of crooked teeth, gaps between your child’s teeth or overlapping teeth, your child may need orthodontic treatment. Ask your child to bite all the way down, but keeping their lips open so you can see their teeth. Do the front top teeth line up with the bottom? Do the top teeth protrude out away from the bottom teeth? Do the top front teeth cover more than 50% of the bottom teeth? Are the top teeth behind the bottom teeth? All these are indicators for potential orthodontic treatment. Look at the alignment of your child’s jaw. Does the jaw shift off center when your child bites down? If you see any misalignment, shifting or asymmetry of the jaw, your child may have a skeletal problem that requires early orthodontic intervention. 3) WHY SHOULD I BE CONCERNED ABOUT A BAD BITE? Bad bites can be detrimental to a patient’s dental health by possibly causing premature wear on the teeth, asymmetrical jaw growth, difficulty in oral hygiene, or malfunctioning bite. Orthodontics will align your child’s teeth for optimum function, hygiene, and appearance. 4) WHAT IS FULL OR COMPREHENSIVE ORTHODONTIC TREATMENT? 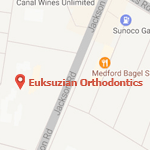 This is another name for orthodontic treatment in the permanent dentition (adult teeth) at any age. 5) AT WHAT AGE SHOULD MY CHILD BE SEEN BY AN ORTHODONTIST? The American Association of Orthodontists recommends that your child be evaluated by age seven. Early detection of some orthodontic problems is important in order to take early corrective action and avoid more difficult treatment later. Most patients, however, are treated during adolescence between the ages of 10-12. 6) WILL PERMANENT TEETH NEED TO BE REMOVED? Years ago it was the exception when teeth were not removed for orthodontic therapy. Today, with the advances in technology and the judicious use of early/interceptive (phase I) treatment, fewer than 10% of our patients require permanent tooth extraction. 7) WILL I STILL BE ABLE TO PLAY SPORTS? Yes. It is recommended, however, that patients protect their smiles by wearing a mouth guard when participating in any sporting activity. Mouth guards are inexpensive, comfortable, and come in an exciting variety of colors and patterns. 8) WILL BRACES INTERFERE WITH PLAYING MUSICAL INSTRUMENTS?